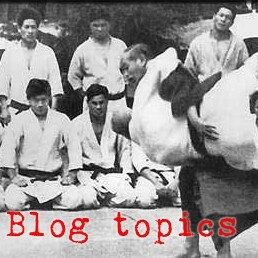 Someone asked me a while back to post what I consider to be pros and cons of aikido and judo – sort of what I like and dislike about aikido and judo. Good, viable self-defense. Probably better for self-defense than any of the empty-hand martial arts that I’ve done for any significant amount of time, including TKD, karate, hapkido, jujitsu, and judo. I’ve heard of old-school judo teachers telling their students that for real self-defense, you do aikido but for sport you do judo. But, on the other hand, the self-defense viability of aikido is probably highly dependent on who you find as a teacher. Almost anyone can do aikido effectively, regardless of physical handicap, age, or fitness level because it is not dependent on size, strength, speed, or even agility. If you can see and walk pretty well, then you can do effective aikido – and there are even large subsets of aikido that you can do without being able to see or walk. Not really great exercise. Aikido approaches self-defense with the ideal of being able to do it effortlessly, and the better you get at aikido the less energy you expend doing it. American aikido guys tend to end up very competent but also overweight and underfit unless they do something else for exercise. Sometimes non-intuitive. The idea of avoiding and evading and not using force is often difficult for young people to grasp. Young adults, especially males, tend to have a lot of trouble figuring out that it is okay to avoid and evade and disengage without necessarily smiting the enemy. They often can’t believe that aikido will be effective. Great for exercise. Good way to maintain strength, aerobic capacity, and flexibility. Great venue for competitive sport activity. You can compete on any level from local grassroots all the way up to Olympic level. Very pragmatic, intuitive, and practical. If it does not put the other guy on his back in a resistive randori situation, it just doesn’t work. Creates very tough fighters. I've heard professionals (i.e. military police) say that they'd rather go into a real fight with a judo guy backing them up than any other martial artist because judo guys tend to be tough and practical. Judo is very standardized. This is because there is an internationally standardized set of competition rules. If you learn in America and go anywhere in the world, you’ll be doing the same judo. Almost all Judo clubs in the world follow the general guidelines of Kodokan Judo, whereas almost every karate club in the world teaches something different. Tends to tear up the athlete after a while. All competitive judoka, without exception, end up with broken toes and fingers, and a great many end up with bum knees. A lot of old judo guys retire into aikido to prolong their mat-years. Problems with grappling? We've all heard the admonition to not go to the ground with multiple opponents or with a guy with a weapon. While that applies to all martial arts equally, it may affect the self-defense viability of judo somewhat. Almost anyone can do aikido effectively regardless of physical handicap, age, or fitness level because it is not dependent on size, strength, speed, or even agility. Maybe--but are the skill requirements prohibitive, compared to other martial arts? For example, compare the effectiveness of a not-very-hard punch in the nose, with the effectiveness of moving almost out of the way of an attack. I'm the one who requested this post, so thanks!! >I’ve heard of old-school judo teachers tell their students that for real self-defense, you do aikido but for sport you do judo. If you told me that a week ago, I would have scoffed. But last night I did my first Aikido randori after a strong lecture from sensei along the lines of, "I don't want to see any fakey, lightweight atemi in here. Also, student so-and-so is going to Japan soon, so he needs to learn how to fall better or he'll get beat up. We're doing randori tonight." We did 1 vs. 2 randori using some really basic technique where the tori tries to grab you and you redirect and toss him to the side. It was the hardest physical activity I've done in a while, so I'm sure I need to learn how to be more efficient. PS I am scared to death of getting injured in Judo, but that sensei says he's not into the hard-hitting stuff (he's in his 60s). I'd say in the case of your example that neither the not-so-hard punch nor the almost-evasion would have much effect at all by themselves. All martial arts to some degree have a backup plan, for when the punch doesn't work or when you can't evade all the way, but in aiki I've found a much more robust, workable set of mutually-reinforcing principles than I found at work in most kick-punch styles that i've had exposure to. For instance, if you are sorta good at controlling ma-ai and sorta good at evasion and sorta good at obtaining an offbalance and you can push forward hard enough to close a door then you have a pretty workable aiki system. We've found that by about green or brown belt (roughly 60-90 mat hours) most folks can handle themselves very proficiently against most attacks in streets, bars, etc... The rest of your life is spend either filling in the corners, refining the nuances in your art, or maintaining skills. I've seen and trained aikidoka with visual and mobility handicaps who were exquisitely effective - some of them after only a few months. I'm glad you posted this Pat from your experience which is much more vast than my own. I've been avoiding the issue with a few people that've asked me since I see them as relatively the same art from different distances thanks to you and Bryce. You know, as of late I've been having a hard time seeing aikido and judo as the same thing but from different distances. Maybe in the future I'll come back around to that idea, but right now I see them as two different things that share a method of practice (at least where I train). In both styles real practice comes from going slow and finding good timing through correct technique. However, aikido is all about being late in a sense that you are alway reacting to what uke is doing. Never trying to guide anything. So there's no offense only def. only responce. Judo however, is all about offense. Good defense in judo is to hit your technique before the other guy gets a chance to do his. That's why we practice de-ashi so much because it allows you more time to get your own hammer tech. rocking. Since you are constantly interrupting the other guy's timing. But that's a side point. So, perhaps they are the same side of the coin in that they are the offensive and def. sides to a single martial art, but you can't do them together so well. I mean you can train both, but it is impossible to apply both at the same time, you have to do one or the other. - distance is not really the factor deciding which one you are doing. The two arts start from different places - judo close and aiki farther. but they grow toward the same thing. Take as an example... judo starts out with close grappling then later on becomes more of the aiki-like separated judo that you see in goshin jitsu, kimenokata, koshikinokata, etc... On the other hand, aiki starts as a separated thing but becomes more of a closely-connected type of grappling like in parts of sankata and the other koruynokata. So aiki and judo share a whole range of distances. It is also convenient and correct to characterize aikido as a defensive avoidance art and judo as an aggressive engagement art. sorta. You can do judo in an aiki-like way and get quite far (so long as you can keep the judges from penalizing you for noncombativity) and you can also do aikido aggressively (though it is hard to do it well and have it still be good aikido). So I _think_ it comes back to aiki and judo being different views of the same elephant. First, and this really applies the most to doing hand rondri, but I think that we call all agree that sometimes the best aikido is not recognizable as a technique in the system. So, let me make a bold statement. It is not the techniques that define a style but the method. Therefore doing "judo in an aiki-like manner" is really doing aikido and masking it as judo. Similarly doing "aggressive" aikido is really doing judo and masking it as aikido. The point of the aiki system that we study is not to learn techniques but to learn how to move and how to get in time with uke. We do this by following uke. Staying safe, but being lead until uke puts himself (herself) in the toilet. So, I still believe that if I'm following I'm doing aikido, regardless of if the technique comes from the aikido curricula or not. At the same time, if I'm causing the off balance or forcing the timing in anyway, i'm doing judo, even if its an aiki move. Both are about being in the right place and the right time, but how they get there are the opposite methods. I think we probably agree more than disagree. I certainly agree that aikido and judo are not just collections of techniques, but rather, collections of principles and strategies which manifest themselves in techniques. But let me give you an analogy and a couple of examples of what I'm talking about. I think this aikido/judo thing is sorta the same thing as whether you call a violin a fiddle or a fiddle a violin. They are the same instrument played in somewhat different spirits. Take a look at gokata in aikido. 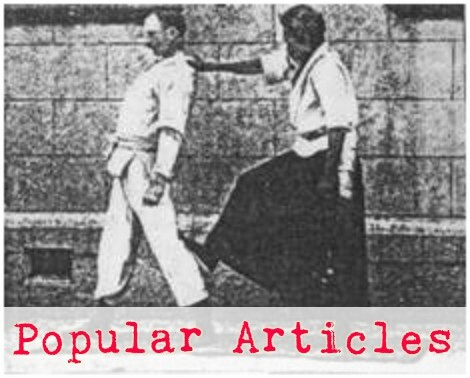 In the beginning there are several techniques (instantiations of principle) in which tori is the aggressor who provokes uke into a defensive reaction which tori then uses to advantage. Later in several techniques in the beginning of that same kata, tori is aggressively moving directly at uke as part of the demonstration of the thing. Take also as an example nagenokata ura - the counter kata invented by mifune as a set of counters for nagenokata in judo. These techniques are very aiki. they are following techniques - all the way up to the pont of being thrown, at which point tori changes it so that he gets the technique instead of uke, who started the thing. So, i think that just like the distance thing is not a real difference between aiki and judo - neither is aggressive/passive or attack/defense a really good separator. There is not, so far as i can tell, a really good way to separate the two arts. They fundamentally make use of the same set of principles and strategies to create technique sets that are more similar than different. But I readily acknowledge that you might be right and I might be completely wrong. I only found this posting now, but it's very interesting. Aikido sounds terrific to me for many of the reasons you cite--particularly the ability to defend yourself without injuring the other person. As one friend put it, when Uncle Willie has had too much to drink at the Christmas party, you can settle him down without hurting him. For me the problem is one of the cons you cited--I really, really need (and enjoy) vigorous exercise in my middle age, and at the moment I don't see how I could have time to "do something else for exercise." I assume you'd need to do at least a couple of hours a week of aikido to advance, right? 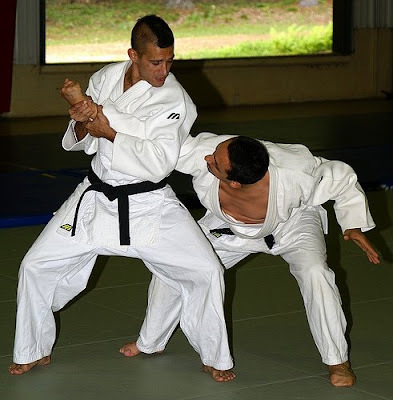 Among the restrictions of Judois that judoka are often bound by the sport's rules, preventing them from using atemi or other self defence tools. Aikido lacks defenees in case of ground grappling. Bobspar - sorry it took me so long to respond. Sure, i'd say it'd take 2-3 hours practice a week in any art, including aikido, to advance at any appreciable rate. You do benefit from 1/week or even more infrequent, but it is easier to get discouraged and drop out when your attendance is that infrequent. Rafeh, Good points you make there, though I'd say that there are certainly judo folks who are more concerned with the self-defense application than the sport rules. I'd also say that aikido mostly lacks ground defense, but not completely. There is suwariwaza in all aikido i've ever seen, and our particular organization teaches the basics of defending from the bottom position, so groundwork is certainly not the specialty of aiki, but it is in there to some degree. I too am trying to decide weather I want to do Judo or Aikido. I think that I am going to make my se4sicion based on the dojo and not the style. That's a good plan. 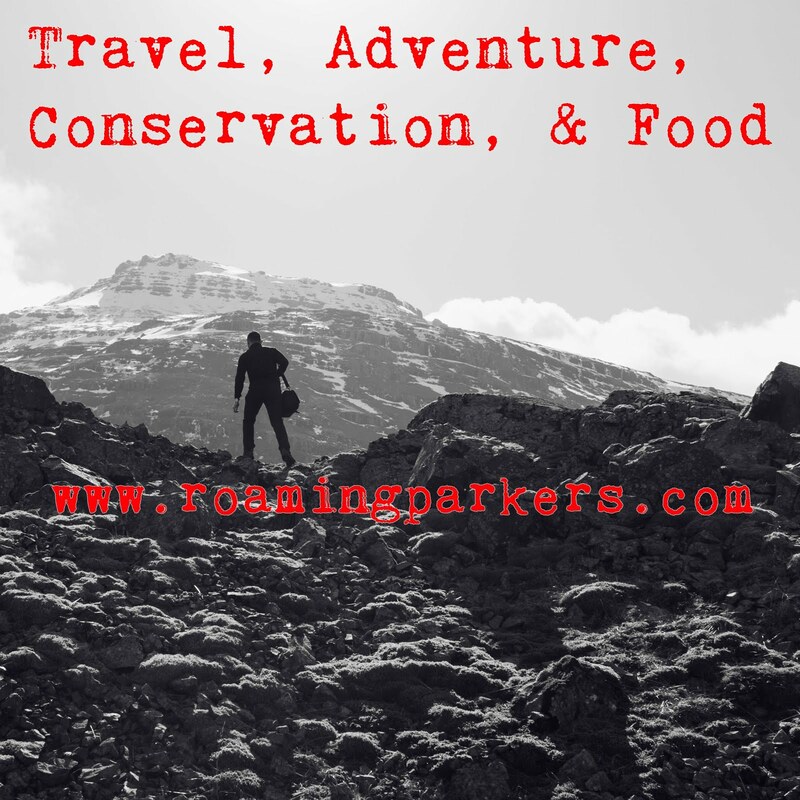 Any martial art that you feel comfortable with and will attend regularly will benefit you more than the Grand Ultimate martial art that you don't like or can't participate in. By all means, decide based on the dojo and especially the peorple that you meet there. "Not really great exercise. Aikido approaches self-defense with the ideal of being able to do it effortlessly, and the better you get at aikido the less energy you expend doing it. American aikido guys tend to end up very competent but also overweight and underfit unless they do something else for exercise." I have a very hard time swallowing that Aikido is better for self defense than Judo. If an aikidoka and a judoka meet, and the judoka attacks, will the aikidoka walk away unscathed? Aikido seems like only half a system. As someone who does Judo and BJJ, and who once considered Aikido, I feel like Judo is just a more complete exploration of the ideas in Aikido; while both concern themselves with a deep understanding of balance and direction of force, Judo takes it a step further than Aikido and asks how it can be used offensively, not just defensively. My BJJ instructor, who started in Karate in the 80's and won a lot of competition contact karate, also practiced a fair amount of JKD and Aikido before discovering BJJ in the early 90's when it started to flower in the US. His advice after a long and well rounded martial arts career? Skip Aikido. Some useful stuff, but inefficient and incomplete.
" If it were useless, it wouldn't be used effectively by the police and the military police. In my 25 years experience, I have found just the opposite of what you describe. Aikido is a more complete system for self-defense than judo - it is almost as if judo is a subset of aikido ;-)"
^^^ This is simply no true. Military and Police organizations routinely hold training programs/seminars featuring instruction in MA that have no demonstrable record of efficacy.....this fact is emphasized by the fact that most police officers(especially in the US) tend ending up looking like a bunch of flailing clowns when caught in a physical altercation with a suspect without backup How is it that we have decades of footage of Judo/BJJ/Wrestling working and working effectively in dynamic situations against full resistance....against strikers or grapplers...but we have no such evidence for Aikido? In theory, yes Aikido is a more "complete" system...but in practice Judo....for the range it was designed for....has proven in practice to be FAR superior to Aikido or any variation thereof. Pressure testing, and pragmatism will always offer better results than theorizing. Ok so this guy obviously has no idea what he is talking about. Aikido and Judo are two completely different systems of self defense just like wrestling and boxing. They have very little in common.